From an internationally renowned expert on US history, this highly illustrated title details the curtain-closing campaign of the American Civil War in the East. Ulysses S Grant's Army of the Potomac and Robert E Lee's Army of Northern Virginia faced up to one another one last time, resulting in Lee conducting a desperate series of withdrawals and retreats down the line of the Richmond and Danville Railroad, hoping to join forces with General Joseph E. Johnston's Army of Tennessee. 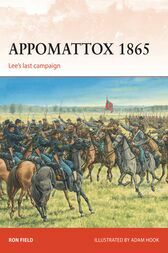 This book, with informative full-colour illustrations and maps, tells the full story of the skirmishes and pursuits that led directly to Lee's surrender, as his frantic efforts to extricate his forces from ever more perilous positions became increasingly untenable. Ron Field is an internationally acknowledged expert on US military history. Awarded a Fulbright Scholarship in 1982, he taught History at Piedmont High School in California from 1982 to 1983, and was then Head of History at the Cotswold School in Bourton-on-the-Water until his retirement in 2007. Ron was also associate editor of the Confederate Historical Society of Great Britain from 1983 to 1992. In 2005 he was elected a Fellow of the Company of Military Historians, based in Washington, DC, and was awarded its Emerson Writing Award in 2013.